Abstract: A robust quantum computer could have been affordably built decades ago based on existing technologies. Diamond’s atomic structure is perfectly suited for the optical form of quantum computing. Proton beam lithography will convert areas below the surface of synthetic diamond film to graphite, so that graphite zones are drawn (and protected beneath a diamond layer) to produce electrically-conductive microcircuitry and wave guides for photons. 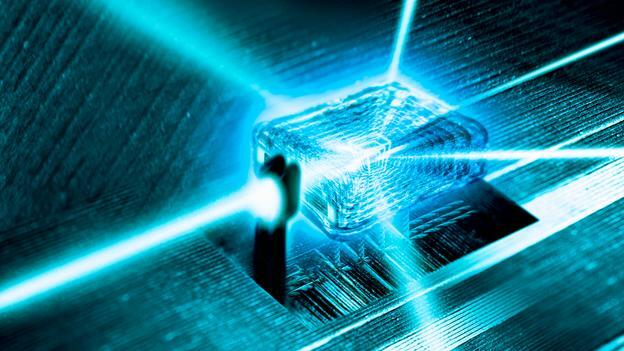 So, quantum computing can be realized without the drawbacks of using other quantum particles. Among the advantages of guiding photons through diamond, decoherence (a major pitfall when creating conventional quantum computing) is nonexistent: Diamond microcircuitry film (DMF) is free of the difficulties of manipulating quantum mechanics although photons are quantum objects. DMF has been proven in principle with a prototype demonstrating current flow within diamond. The task now is to use a proton beam to configure specific waveguides in diamond film to create a DMF quantum computer chip. The costs of proton beam lithography and synthetic diamond film are affordable. The quest for the elusive quantum computer sprang from the minds of mathematician Yuri Manin and physicist Richard Feynman. Like their colleagues, they recognized the need for a computer powerful enough to simulate physics, including the complex quantum mechanics branch. Calculating vast quantum mechanics variables overwhelms a transistor-based supercomputer. In 1980, Manin proposed the idea of quantum computing — computing mechanisms based on the behavior of energy and matter at the quantum scale. By 1981, Feynman proposed a basic model for a quantum computer during a presentation at MIT. It took considerable time for researchers to begin seriously thinking about how to accomplish the novel task. But Feynman’s long persistence began paying off when a few experts imagined how quantum mechanics might be manipulated to perform computing. The advantages of quantum computing were too great to ignore. A quantum computer can calculate immensely faster than a conventional supercomputer. The reason for the speed difference is that the bits of a conventional processor are either zero or one. With a quantum computer, the bits are zero or one — but quantum principles mean they can also be zero and one simultaneously. These bits are called ‘qubits,’ and using them results in an exponential speedup in computing — an increase that becomes more and more rapid with constant doubling. So, with a quantum computer, only one calculation is needed to test a tremendous number of possibilities. A standard processor must grind through every possible calculation one at a time. Solving a problem with a quantum computer can mean the difference between taking years of processing with a standard chip versus seconds with a quantum chip. Some complex problem arrays would take a classical processor longer than the universe is old to provide a correct calculation. A quantum computer can solve life or death problems, like calculating the positions of particles in viruses. There are a vast number of possible ways a virus’s particles can interact, and a normal computer is too slow to predict them all. But a quantum computer can calculate a virus’s workings, and is essential in our era of rapid travel that quickly enables international viral spread. Qubit computing allows simulations of complex chemical reactions. This enables simulated pharmaceutical drug testing — with computing powerful enough to quickly simulate the best medicine for everyone’s individual physiology. In manufacturing, adding on a 3-D printer can result in formulas for advanced new inks and truly ingenious products that cannot be made any other way. Among a myriad applications, qubit computing allows for materials to be designed and tested in simulation, so that all their properties can be determined. This ability can facilitate building factories in the vacuum and gravitational conditions of outer space. Because of the effects of gravity, many valuable products can be made in space that cannot be made on the Earth. Configuring a quantum computer with a word dictionary enables vast computations at once when using quantum search algorithms (step-by-step procedures for calculations). Configured this way, a quantum computer could spontaneously answer questions, and be fully engaged in tough problem solving and explanation in a way humans readily understand. Configuring a quantum computer with knowledge databases will enable the design of singularity models, so humankind is equipped to orchestrate the best way to usher in a technological singularity. Information and knowledge must be accompanied by great wisdom, so that ever-increasingly powerful technologies never spin dangerously out of control instead of being beneficial. Conventional machine learning has already mastered ethics, and so wisdom is not an impossible goal. In 2014, Chinese physicists achieved the first quantum artificial intelligence that recognizes handwritten characters. The list of tasks a conventional computer can perform that a quantum computer cannot is shrinking because of increased resources poured into quantum computing software and algorithms. In short, a quantum computer can solve problems impossible for standard computing to ever solve. The potential rewards are so great that the international quest to revolutionize computing by utilizing the principles of quantum mechanics became a great goal that steadily inched towards realization as decades passed. In 2011 — some forty years after the proposals of Manin and Feynman — D-Wave Systems, Inc., in British Columbia, Canada, announced the first quantum computer. They called it the D-Wave One; its upgraded D-Wave Two was announced in 2013. D-Wave Systems, Inc. raised $160 million to produce these products. Even with powerful financial backing and D-Wave devices passing a series of tests, the system is not without serious problems. A June 2014 study determined that the D-Wave Two may not be able to realize a quantum speedup (that vital exponential increase), or that the needed speedup may exist but is masked by problems in the works. D-Wave Systems is working on conclusive proof of quantum effects (quantum entanglement) in its D-Wave devices. The last word is forthcoming because the problems of perfecting and assessing the D-Wave System are so severe. Operating the D-Wave System requires a 10-square-foot appliance to keep a 1-square-centimeter chip at a temperature of near absolute zero (-459.67 °F). This is because the D-Wave involves superconductivity (the property of zero electrical resistance at such low a temperature). D-Wave devices suffer decoherence (illogical and inconsistent data). Decoherence poses one of the major problems of creating a quantum computer chip. The smallest vibration can ruin data coherence, so that the computer’s calculations are corrupted. Even cosmic rays from outer space reaching Earth can cause decoherence. Vibrations from nearby street traffic can cause decoherence. What if there is a much easier way to build a robust quantum computer, and do so affordably? What if this chip could work in a wide range of temperature extremes with no need for cooling? What if the quantum chip could fit into a cellphone instead of requiring a large space? What if it is immune to decoherence? What if it could be made of fairly inexpensive material, and configured at such a relatively low cost that a myriad of dexterous quantum brain robots could be built — robots that do not take an hour to fold a towel like today’s robots assessed to have the brainpower of an insect? What if it is tolerant to the hard radiation and temperature extremes of outer space, so that robots mostly use space materials to build on the Moon, Mars and other space destinations — and reliably do so for prolonged periods? What if they could provide the intelligence to automate and maintain these facilities? What if they were smart enough to take full advantage of the resources in our solar system, so as to provide revenues that enrich the Earth’s populace and raise the human condition as a whole? Does this potential exist? Yes. Such a quantum computer can be built now. Here is why and how: A qubit can be any quantum particle, like an electron, atomic nucleus, or photon. Diamond has an arrangement of carbon atoms that is perfectly suited for manipulating photons in a three-dimensional space. This arrangement produces ideal architecture for photonic crystals that manipulate light for quantum computing. All basic elements of quantum computing have already been demonstrated with diamond. Optical computing is naturally quantum computing without the obstacles researchers have encountered so far. Using photons is more practical because light is much easier to control than individual atoms, which are traditionally used in quantum computing projects. Manipulating light is based on well-known classical physics backed by many decades of research. So, the optical system is free of the unknowns and other obstacles of manipulating quantum mechanics even though photons are quantum objects. A laser beam will pass through diamond without losing coherence, too. This is because diamond shields photons from interference, so that data distortion is prevented. Diamond thereby eliminates a major problem of building a reliable quantum computer. The visible light spectrum supplies many billions of qubit positions for optical quantum computing. Pure white (colorless) diamond is the most transparent of all materials. White diamond reflects visible light, ultra-violet light, infrared light, and all the wavelengths (colors) of the spectrum in between. Light beams of different wavelengths crisscross without interfering with each other, too. Researchers have devised a number of difficult-to-achieve approaches to converting diamond to a quantum computer chip. The task involves creating strategically-located defects within the gemstone to produce wave guides along which photons are either reflected or blocked. This takes us to the straightforward solution advocated here. Decades ago, a major leap in electronics took place. It was far ahead of its time. But it was never industrialized. The brilliant concept of diamond microcircuitry film (DMF) arose from the minds of physicist Gisela A. Dreschhoff, a Director of the former Radiation Physics Laboratory at the University of Kansas’ Space Technology Center, and her co-inventor. She and her co-inventor, geophysicist Edward J. Zeller (1925–1996), who previously served as Director of the same laboratory, used a proton beam to produce a prototype to demonstrate their concept. Protons are about 1800 times more massive than electrons, and protons penetrate into materials instead of impacting the surface. So, protons penetrate below the surface of diamond and leave its surface unscathed. This allowed Dreschhoff and Zeller to ‘write’ three-dimensional patterns within synthetic diamond film with a proton beam. The path of a proton beam is very straight, resulting in precise, well-defined lithography. So, they were able to draw lines in any desired way. The proton beam converted the beamed areas to graphite. The result was channels of graphite ‘written’ below the surface of the diamond film. Dreschhoff and Zeller thereby produced the ideal circumstances for making highly advanced electronics: Graphite is a good conductor of electricity. Diamond is a good electrical insulator, and has extraordinary properties — some of which exceed those of all known materials. Diamond microcircuitry film (DMF) was born. Their accomplishment translates into creating a quantum computer with strategic light-guiding zones within diamond. When one creates a strategically-located defect (such as a graphite zone) through a diamond crystal lattice, photons will be either reflected or blocked. Three-dimensional graphite zones also serve purely electronic portions of a computer and other electronics, satisfying the original purpose of DMF. We are looking at creating a quantum computer robust enough to function in outer space for prolonged periods. Most computers operating in space (the IBM RAD series) run at about the level of a 1984 processor. The latest RAD generation is somewhat better. Space computers sacrifice intelligence for a process called ‘radiation hardening’ (making them more tolerant to cosmic radiation). The problem disappears with DMF because diamond is naturally radiation hardened. Radiation hardened technologies in spacecraft tolerate more than one megarad. Diamonds take exposures of up to 8000 megarads during color enhancement treatments. Diamonds are subjected to proton bombardment in cyclotrons, and tolerate very high-energy particle radiation of many types. The processing speed of today’s space computers explains why Martian robots take a month to do what a human on Earth can do in an hour. Much higher intelligence performance is required for robots to construct sophisticated facilities suitable for humans on the Moon and Mars, and to begin terraforming these celestial bodies, etc. Because of limited tolerance, today’s space computers can malfunction when exposed to cosmic radiation, as many mishaps in space show. Conventional electronics, including computers, must be kept within their working temperature range, too. Bulky heating and cooling regulation machinery accompanies electronics sent to the Moon and Mars. This needed bulk has hindered the advancement of mini spacecraft and robotics that can make building in space affordable. The problem disappears with DMF because it can work in such great temperature extremes. Conventional electronics and computers are also prone to failure from intense electromagnetic phenomena, such as occurs on the Moon, Mars, etc. Diamond operates at much higher voltages (because of its wide bandgap) than silicon — making DMF substantially more resistant to large voltage surges. A diamond wafer one centimeter thick can endure 10 million volts — the voltage of a minor lightning strike. The same voltage will destroy silicon. Basic electronics, computing and robotics can all be made to tolerate harsh outer space conditions. DMF can be made into semiconductor devices, integrated circuits, very compact light-emitting diodes, electrodes, transistors, sensors, signaling devices, memory devices, resistors, capacitors, inductors, diodes, electrodes, switches, circuit boards, etc. Although graphite is soft, it is very radiation tolerant and heat stable, and in DMF it is strongly protected by hard diamond. So, the main building blocks of most electronics and computing can be DMF-based for space applications. DMF can also be made into a conventional computer chip. The electrically-conducting graphite channels can be drawn in any three-dimensional pattern(s) — including whole circuit boards. No metal connectors are required. This is ideal because until all needed quantum software and algorithms are developed, it will be advantageous to work with space computing that functions with existing technologies. Hundreds of satellites in orbit facilitate communications, weather forecasting, GPS, spying, etc. They can fail when blasted by intense solar flares. DMF-based satellites and power grid protection devices would withstand cosmic radiation levels that knock out conventional electronics devices. It may be possible to shrink DMF devices to the nanoscale. The key to producing DMF nanodiamond computing and robotics is to reduce the size of the aperture of a high-powered proton beam as much as possible. When the DMF prototype was made, the aperture was in the micron range, and so its graphite channels are presently one micron and above. Significant reductions in aperture size have since been realized. Protons measure on the femtoscale (below the nanoscale). So, Feynman’s famous statement applies: “There’s Plenty of Room at the Bottom.” Producing DMF with a nanoscale proton beam aperture can result in more functionality at a smaller size when creating artificial intelligence and robotics. There is always the possibility that quantum mechanical effects will hinder performance. But the potential pay-offs make it worth a try. What will it take to produce the first DMF quantum computing chip? Funding for the first DMF optical quantum computer chip can be raised through the sale of the book Moon Base and Beyond, which describes the GEO-DMF System and technologies that work well with it in outer space. This system produces a practical means of profitable outer space development, including automated factories, greenhouses, human habitats, space mining and much more — and how to realize such developments much sooner than science predicts. The book advocates increasing the space economy to uplift all of Earth’s people — and spreading the new wealth from space evenly instead of a just making the rich richer. To champion this goal, $10.00 per ebook copy sold will be used to raise funds. A sales figure of 50,000 can raise $500,000 to sponsor the first step of the larger goals, which is to build a DMF quantum computer chip. The next steps will be to build a DMF-based robot, then attempt size reduction to the nanoscale. Reductions in the costs of single crystal diamond film and proton lithography, and the decades of research already done on optics, quantum computing and robotics make these goals financially and technologically feasible. Margaret Morris devised the GEO-DMF System for robotically building automated solid rock outer space facilities, which she describes in her book 'Moon Base and Beyond' (Scribal Arts – 2013). It is featured along with reviews from highly-qualified experts at the following link: https://payhip.com/b/5IrW Margaret worked for decades as an assistant to Dr. Joseph Davidovits, the award-winning founder of the chemistry of geopolymerization in the 1970s and founder of Barry University's (Miami Shores, FL) former Institute For Applied Archaeological Sciences (IAPAS) in 1984. Dr. Davidovits re-created modern counterparts to ancient cements and mortars, such as those of ancient Egypt and Rome, that have survived harsh environmental conditions for thousands of years in ancient archaeological ruins. As numerous microscopic and chemical analyses show, some of the ancient cements can pass for natural rock when mixed with rock aggregates. In her positions at the IAPAS, Margaret began conducting research on pharaonic architecture and Egyptian antiquities in 1984 and later served as Assistant Director. In 1990, geophysicist and micropalentologist Dr. Edward J. Zeller, then Head of the former NASA-funded Radiation Physics Laboratory, at the Space Technology Center of the University of Kansas, began working with Morris on the analysis of samples of Egypt's Great Pyramids. In 1995, he introduced her to his co-invention of diamond microcircuitry film (DMF) with physicist Dr. Gisela A.M. Dreschhoff, who served as the Head of Radiation Physics Laboratory after Dr. Edward J. Zeller unexpectedly and unfortunately passed in 1996. Working with these experts gave Morris a unique background of experience with both geopolymerization and DMF. Under the mentorship of physicist Dr. Gisela Dreschhoff, Morris devised the GEO- (geopolymerization) DMF System for building automated space architecture as a tribute to the late Dr. Edward J. Zeller. Using NASA's geological surveys, Morris also identified all of the ingredients necessary to create geopolymerized rock with materials on both the Moon and Mars. She innovated the concept of producing robotics with optical quantum computing brains with DMF, which is able to tolerate the harsh conditions of outer space. The GEO-DMF System can be used to robotically build automated, virtually permanent megalithic architecture (for factories, habitats, greenhouses, etc.) on the Moon, Mars and elsewhere in outer space. For more on the utility of the GEO-DMF System, see an article at Moon Daily: http://www.moondaily.com/reports/Moon_Base_and_Beyond_999.html Morris has published papers and debates with scientists in technical and science journals, including 'The Journal of Geological Education.' She has debated top geologists on issues related to geopolymerization, including Dr. Robert L. Folk, Department of Geology, the University of Texas, Austin, Texas, and Dr. James A. Harrell, then Head of the Geology Department at the University of Toledo, in Ohio. She has co-authored with the internationally recognized chemist and materials scientist Dr. Joseph Davidovits. Their book 'The Pyramids: An Enigma Solved' (Hippocrene, NY 1988) was awarded two-starred reviews (one for the adult reading category and one for the teen category), by the American Library Association (Booklist, November 15, 1988). A star indicates a work judged outstanding in its genre. Her book 'The Great Pyramid Secret' (Scribal Arts, 2010) contains special contributions from Dr. Edward J. Zeller, Dr. Michel Barsoum, a Distinguished Professor of Materials Science at Drexel University, Professor Linn Hobbs of MIT's Department of Materials Science and others. Dr. Michel Barsoum read an early draft of 'The Great Pyramid Secret' (Scribal Arts, 2010) and was inspired to organize an international team of scientists to study its premise. Michel Barsoum et al. write in their first peer-reviewed paper on this research that the sophistication of the recovered pyramid technology is "…simply astounding….We are also very grateful to Ms. M. Morris, who has been invaluable and unstintingly generous with her time and knowledge, and without which this work would not have been possible." Dr. Michel Barsoum's first peer-reviewed paper on this research was published in the 'Journal of the American Ceramics Society,' Volume 89 Issue 12, Page 37-88 - December 2006. The authors of this paper on the pyramids are: M. W. Barsoum, A. Ganguly, and G. Hug. This is a very interesting article! It’s depressing that so much progress could be made, if only the money would start flowing. Computing and transhumanism are inextricably linked. Hopefully governments and wealthy investors get on board soon. So much good could be done with more computational power and better robotics. Thanks very much, SB. We hope that it can be accomplished by the people for the people though, so that everyone will be uplifted with new wealth from space ventures. The normal course of things is that wealthy investors get much richer and the bulk of the people on our planet stay poor and sick. A 2006 United Nations study determined that one percent of the population owns 40 percent of our planet’s wealth (and that could be a conservative estimate), and the figures have since dramatically increased in favor of the wealthy. But I believe a dedicated community of like-minded people working to secure a good future for everyone by building a large Space Economy can make all of the difference – and that extreme longevity and transhumanism can be an outcome, too. You are leaving out that a company called Scio diamond and element 6 (a De beers company) have the tools needed to grow flawless diamonds at a low cost in their labs. This is very Important to mass producing chips and creating a quantum internet. Thanks Isaac for taking a look at my article. The various manufacturers of synthetic diamond are not within the scope of my article (which has to be kept rather short), so they are not simply left out. In my book ‘Moon Base and Beyond,’ which has a much broader scope, I mention Element Six and others. I also point out how the price of synthetic diamond has dropped dramatically over the years, which is a very fortunate development. You are certainly correct that today’s synthetic diamond technology is very important to mass producing quantum chips with diamond, and to the revolutionary transformation to a Quantum Internet.